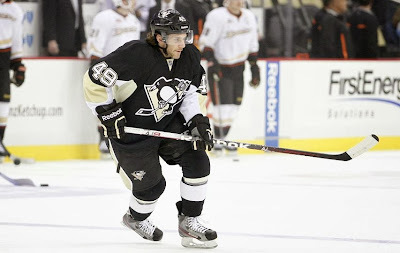 Last night Brian Gibbons (hockey superstar) and the Pittsburgh Penguins hosted the Anaheim Ducks. The Penguins won the game 3-1 in Pittsburgh thanks to a goal and an assist from Gibbons in his NHL debut and an incredible night from Marc-Andre Fleury who finished the night with 27 saves. Unlike most recent games, the Penguins did not look good in the first period. Based on our recent record one couldn't help but think that that was a good thing. 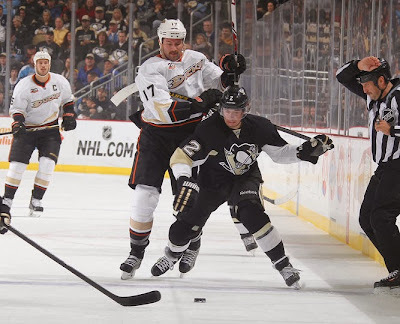 The Ducks really came out hard and looked like the stronger team out shooting the Penguins 12-3. If it was not for Flower and some HUGE saves this game would have looked much different. 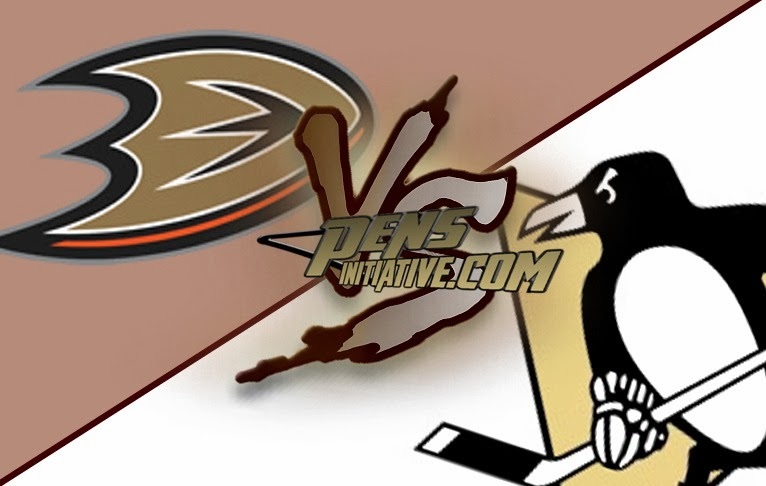 Whats worse, is not only did we only manage to land 3 shots on Ducks goaltender Fasth, but we didn't get our first on net until the 18 minute mark which was our reminder that there was actually fans watching inside Consol Energy Center. Weather they were excited cheers or sarcastic, it was nice hearing you guys/girls! The first period ended shortly after goalless. THANK GOODNESS! The Penguins came out a little harder in the second period getting more shots on net... in the first few minutes... WHICH IS GOOD! They actually out shot the not as mighty Ducks in this period 12-5. The Pens got their first chance on the power play at the 13:18 mark when Luca Sbisa got a two minute minor for Cross Checking Brandon Sutter. Luckily for the Ducks we try not to show off too much on the power play. We proved that again when Corey Perry took a minor for tripping Dupius. One would argue that Duper did a similar trip right before the call but I would not be one of those people.. The Pens didn't capitalize (shocking) before the period would end and the penalty would carry over into the third. Incredible hockey. It appeared that both teams realized they were two of the best teams in the NHL and decided to show it. The first 5 minutes and 20 seconds was truly a show. First up, Malkin who has not looked the best in his past... forever made a beautiful play that would lead to Brian Gibbons getting his first NHL point. I dont think I can do it justice so here is one of those fancy moving images people love on the internet. That would put the Pens up 1-0. They didn't stop there. A little over a minute later Brandon Sutter would would score his forth of the season with a tip in increasing the lead to 2-0. The Ducks would not wait long before adding their mark to the score board. Not even 30 seconds after this goal Ryan Getzlaf would score a goal to make it 2-1. Shortly after that goal Pittsburgh would take its first (and only) penalty of the game when Joe Vitale took an interference call. And you thought Consol was quiet in the first! The Pens managed to kill of the penalty with the help of Fleury who kept the Ducks best chance out of the net. Not long after the Penguins killed the penalty Sidney Crosby managed to put the Penguins up 3-1 with this solid effort. The Ducks kept coming but couldn't manage to score on Flower. This was their best chance but MAFFFD! That was it. The Penguins wan a tough game 3-1. Final shot totals were 28-27 for the Ducks which is impressive considering we only got 3 in the first. Letang was held to just under 25 minutes. This is probably a good thing for him and the team. I didn't really notice Beau with Sid. Maybe they will need more time to look better together. The Pens (not Letang) gave the puck away 6 times. Our next game is Wednesday in Washington when we face Ovechkin and the Capitals. The game starts at 8pm. Here are some funny NHL.com pics from last nights game. Even the linesman wants to dance.